The Pilgrims were ultra-religious Christians who rejected the Church of England and were therefore viewed as separatists. After fleeing to Holland where they were merely tolerated, they finally got the chance to move somewhere where they were free to practice their religion as they saw fit. In 1620, they set sail for the New World, and landed at Plymouth Rock in 1620. 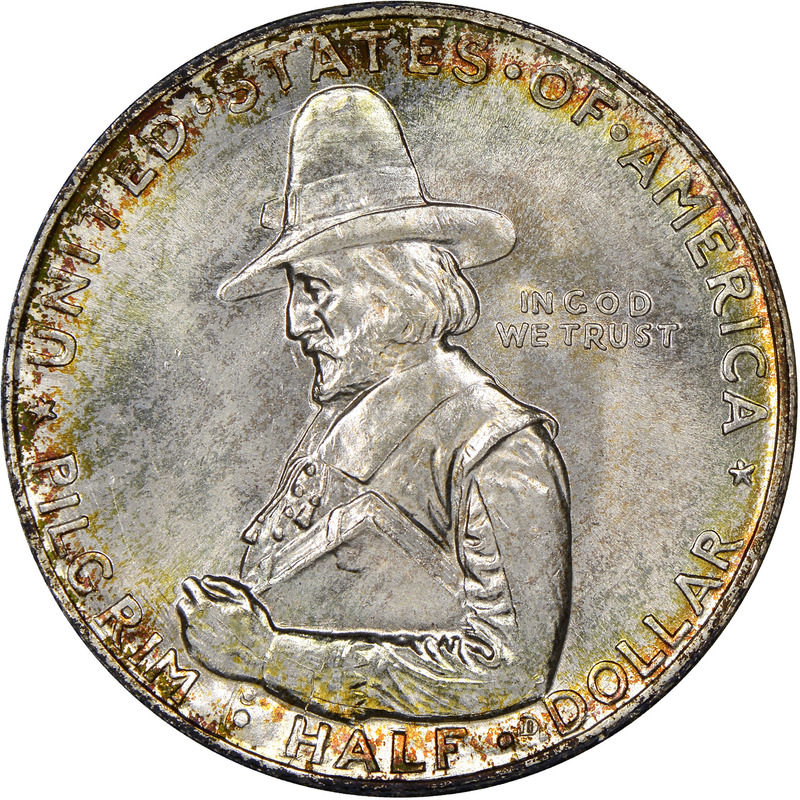 In honor of the 300th anniversary of the Pilgrims’ arrival, as well as to help fund events honoring them, the Tercentenary Commission sought the striking of 500,000 commemorative half dollars. While the Commission originally sought this large mintage of half a million coins, Congress only approved a still-generous mintage of 300,000. 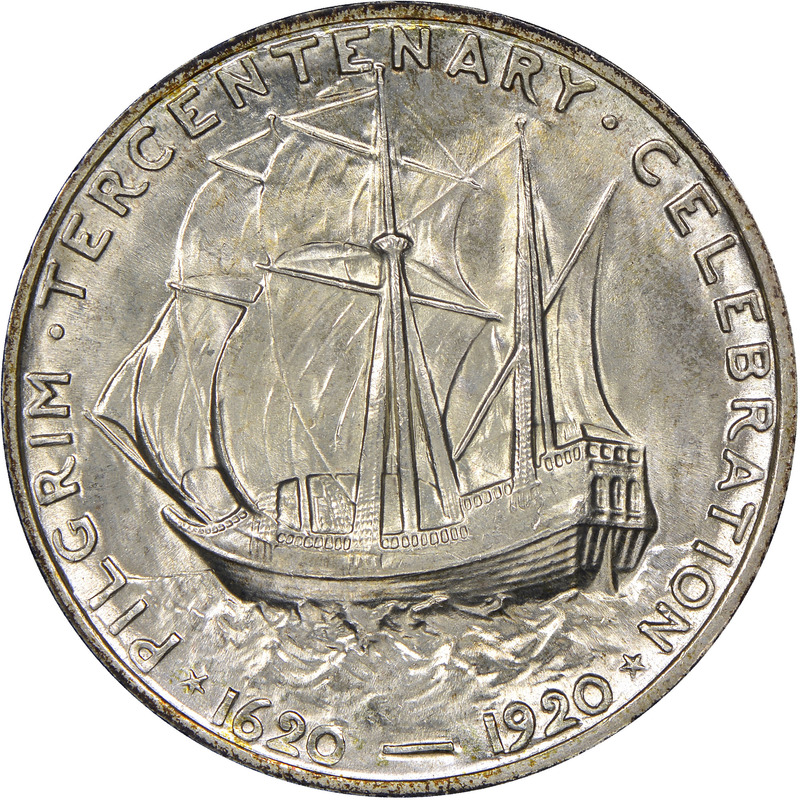 The Commission selected Boston sculptor Cyrus E. Dallin to design the coin. 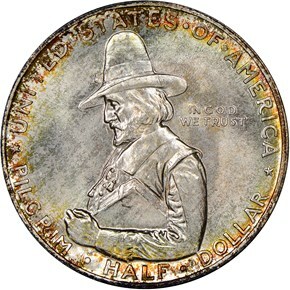 His obverse depicts a left-facing, half-length figure of William Bradford, the second governor of the Plymouth Colony. He holds in his left arm what is most likely a Bible. Behind his portrait is the motto IN GOD WE TRUST, while the legends UNITED STATES OF AMERICA and PILGRIM HALF DOLLAR are arranged peripherally, separated by stars. 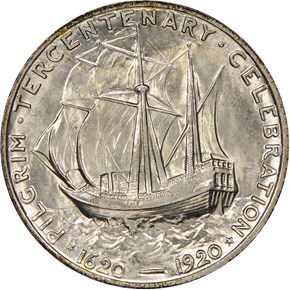 The reverse is dominated by a three-quarters view of the Pilgrim ship Mayflower sailing on rough seas. The inscription PILGRIM TERCENTENARY CELEBRATION is arranged peripherally. Separated from it by stars are the dual dates 1620—1920. Unfortunately for the Commission, the coins were not ready until late in the year, well after many of the celebrations they were supposed to help fund had already taken place. By the end of 1920, some 48,000 coins remained of the 200,000 actually struck. The Tercentenary Commission requested that these be melted and re-coined the following year with the new date 1921. This request was granted, and a small “1921” was added to the left obverse field. Only 80,000 coins were struck that year, and the Commission was only able to sell a quarter of them. The remaining 60,000 coins were returned to the mint to be destroyed, which left net mintages of 152,000 for the 1920 issue, and only 20,000 for the 1921. Due to this disparity in mintage, the 1921 issue is much more valuable than the 1920.